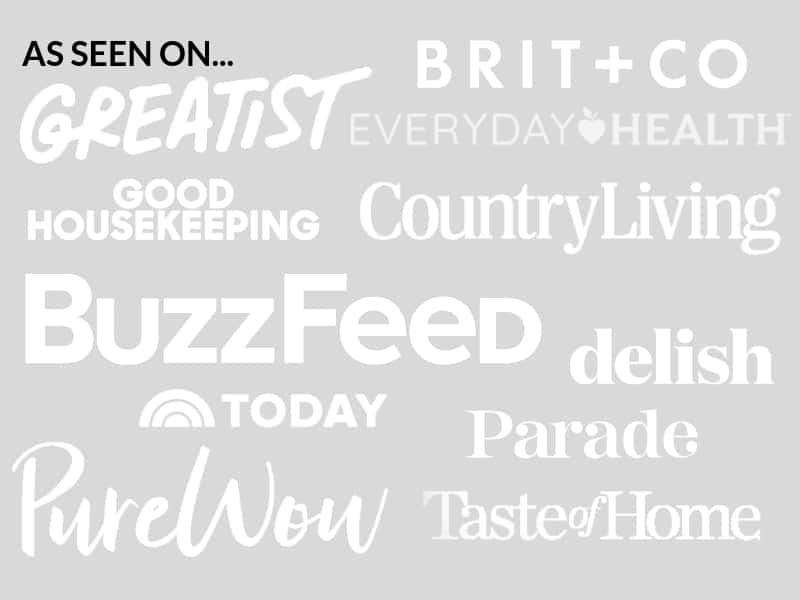 March 18, 2017 By Elizabeth Lindemann Leave a Comment / This post may contain affiliate links. I think I’ve stumbled upon the Holy Grail of soups. 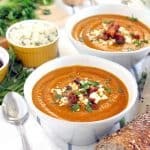 Smoky Sweet Potato Soup with Bacon and Bleu Cheese is the most wonderful combination of flavors- smoky, spicy, and slightly sweet pureed soup is topped with crunchy bacon and sharp, tangy bleu cheese crumbles. It’s packed with tons of sweet potatoes and carrots, some of the most nutritious veggies out there. It will definitely keep you warm during these last few weeks of winter (she wrote from sunny, 80 degree Texas… sorry, Northern folks). There are two things that give this recipe its smoky deliciousness- bacon (yum), and smoked paprika (one of my favorite spices). The bacon is cooked until crispy, removed and reserved for garnish, and the bacon grease incorporated into the soup instead of your usual butter or oil. A big ol’ heaping teaspoon of smoked paprika is added, as well as chili powder and cayenne pepper for a bit of a kick. 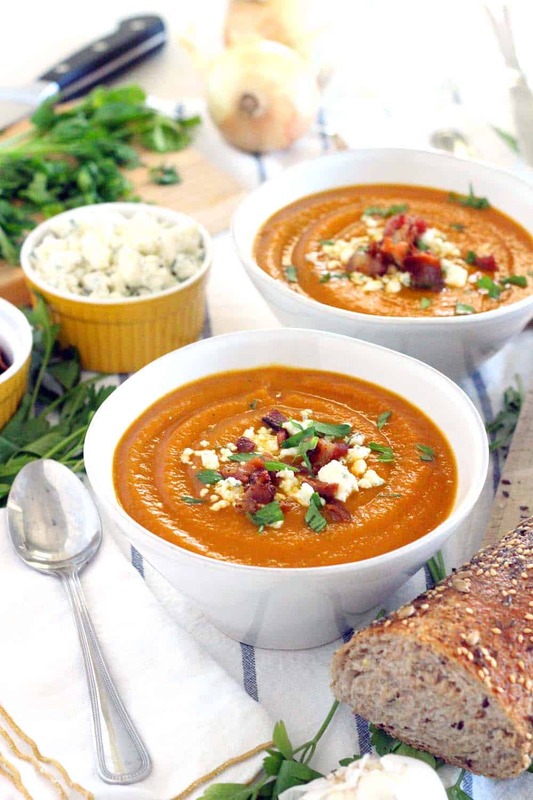 I don’t want you to miss out on this soup if you are vegan or vegetarian. While you may miss out on the crunchy bacon or bleu cheese topping, there are some simple omissions and substitutions you can make to make these meat-free or plant-based (see recipe notes below). You can top it with croutons for a bacon-free crunch on top! You can also easily make this paleo/whole30 compliant by omitting the cheese and using a sugar-free bacon. This soup requires blending to make it velvety smooth. I highly recommend using an immersion blender, or stick blender, for this purpose. I think it’s my FAVORITE kitchen tool. Just stick it in the pot of soup and press on- the soup purees perfectly. I use mine for smoothies- just put all the ingredients in a glass or wide mouth mason jar and blend it right in there! A day of not cleaning a blender is a good day in my book. But if you don’t have one, you can also blend this soup in batches in a standing blender. 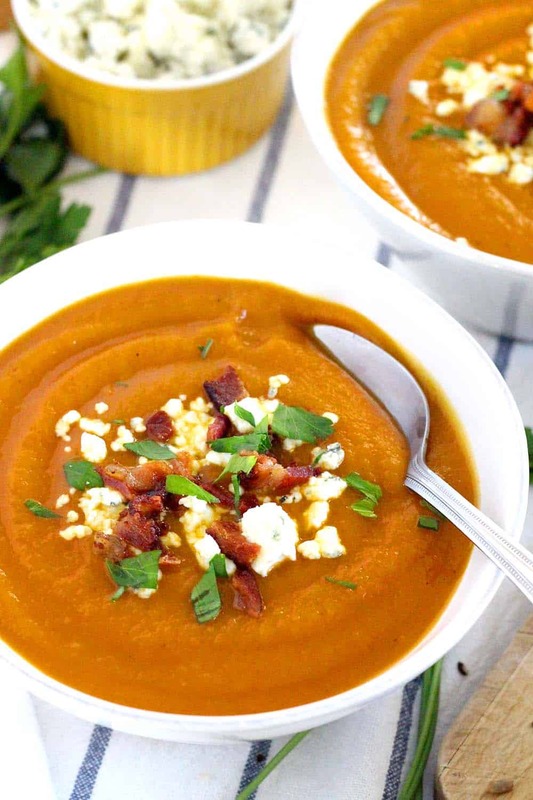 This Smoky Sweet Potato Soup is topped with crunchy bacon and tangy bleu cheese crumbles- an easy and DELICIOUS recipe! Vegetarian/vegan/Paleo optional. Cook the bacon until crispy in a large pot over medium heat. Remove bacon and set aside on a paper towel to drain. Add the garlic, smoked paprika, chili powder, cayenne pepper, salt, and pepper. Stir to coat for one minute, or until garlic becomes fragrant. Add 4 cups chicken broth, the carrots, and the sweet potatoes. Bring to a boil, cover, and simmer for 20 minutes, or until vegetables are tender when pierced with a fork. 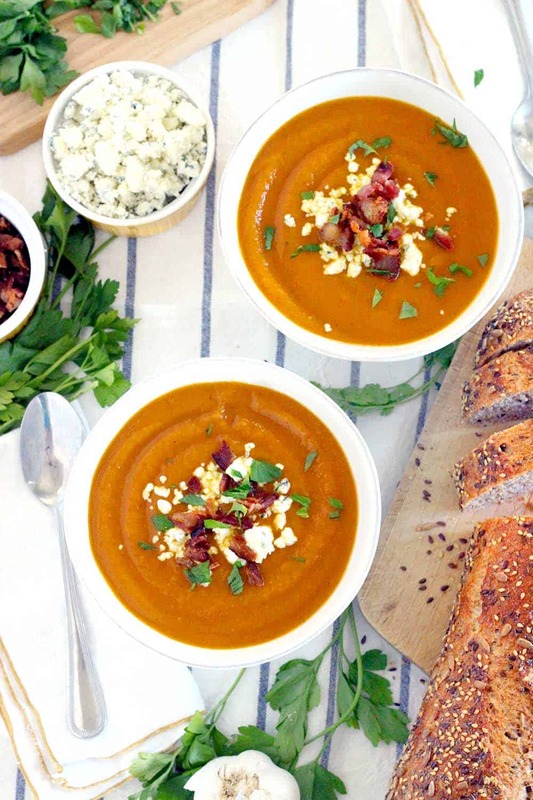 Use an immersion blender to puree the soup (or a standing blender in batches). If the soup is too thick, add more chicken broth 1/2 cup at a time, pureeing each time for a creamier texture. Serve with bacon pieces and bleu cheese crumbles on top, garnished with parsley if desired. For a vegetarian version, substitute butter or olive oil for the bacon/bacon grease and vegetable broth for the chicken broth. For a vegan version, use olive oil, vegetable stock, and omit the cheese. For a paleo/whole30 version, omit the cheese and use compliant (sugar free) bacon. This soup can be frozen in an airtight container for up to 6 months.